Our 2017 Ford Fusion SE Sedan is presented in Magnetic lets the world know you mean business! Powered by a Duratec 2.5 Liter 4 Cylinder that offers 175hp while connected to a smooth-shifting 6 Speed Automatic transmission for easy passing. Nimble and precise, our Front Wheel Drive Fusion delivers a composed ride that''s comfortable for all-day trips while scoring near 34mpg. 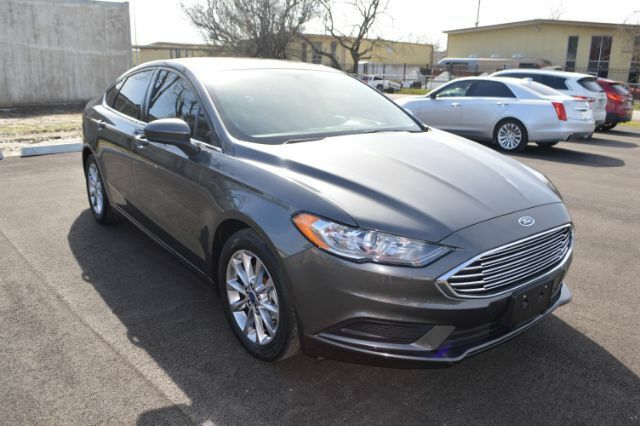 Our Fusion SE is designed to be noticed with a sculpted design and illustrates its style credentials with beautiful alloy wheels, automatic headlights, an exterior keypad entry, and LED daytime running lights. With upscale materials and meticulous attention to detail, the SE interior appeals to every sense with a wealth of amenities including the new low-profile rotary gear shift dial, full power accessories, a rearview camera, and 60/40-split folding rear seats. SYNC helps keep you connected with audio and phone voice commands, Bluetooth connectivity, smartphone app integration, and an AM/FM stereo with available satellite radio as well as a CD player, and MP3 capability. Confidence comes standard with anti-lock disc brakes, traction/stability control, advanced airbags, and the Ford Sync emergency crash-notification feature that automatically dials 911 when paired with a compatible cell phone. Parents will especially appreciate the added peace of mind of Ford''s MyKey, which can be used to set certain parameters for your teen drivers. Distinctive in style and highly efficient with substantial power and security, this Ford Fusion is the intelligent choice for you! Print this page and call us Now... We Know You Will Enjoy Your Test Drive Towards Ownership!